Dr. Laura Plexico in the College of Liberal Arts is the Principle Investigator on an R03 NIH research grant to study hormones and vocal function in women. She is collaborating with Dr. Mary Sandage in the College of Liberal Arts, Dr. Heidi Kluess in the School of Kinesiology in the College of Education, and Dr. Rita Patel at Indiana University, all co-investigators. Together they are studying how estrogen, progesterone, testosterone, and neuropeptide Y change throughout a woman’s menstrual cycle and affect vocal function. The grant awards $300,000 over three years. Dr. Plexico’s interests include voice assessment and speech science. 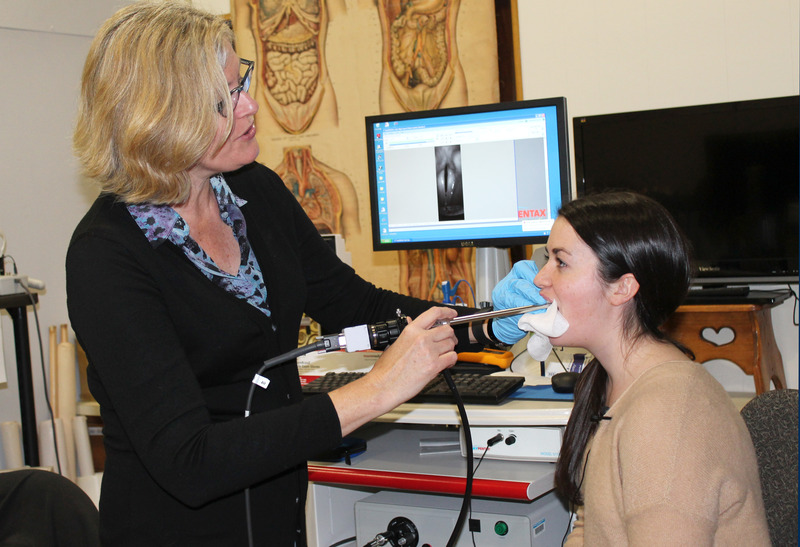 Dr. Sandage’s research focuses on voice and upper airway disorders. Dr. Kluess studies vascular and respiratory physiology, particularly in females. Dr. Patel’s research interests include vocal physiology and voice production in normal and disordered voice across the lifespan. The researchers received the grant award in the summer of 2014 and data collection began in February 2015. “Women have a significantly higher prevalence of voice disorders than men and the cyclic hormonal fluctuations that accompany the menstrual cycle is clearly a differentiating factor between the two groups,” said Dr. Plexico. The larynx is a hormone target organ and there is cause to believe that there are physiological changes in laryngeal function secondary to hormonal fluctuations, like those that occur with the menstrual cycle or menopause that can result in voice quality and function differences. However, the reasons for the proposed voice changes are not well understood. Therefore, the purpose of this grant is to develop a better understanding of voice function differences observed throughout the different phases of the menstrual cycle and the influence of the associated hormonal fluctuations on vocal function. This grant is a first step in identifying periods of vocal vulnerability in healthy women. The study consists of 15 pre-menopausal women and 15 post-menopausal women. Each comes in for data collection at four specific time-points during her menstrual cycle. Dr. Plexico and Dr. Sandage are using high-speed imaging and acoustic measures to look at vocal function during different phases of the menstrual cycle. The participants are asked to complete tasks that evaluate laryngeal airway resistance, the frequency and intensity of the voice as well as vocal range and function. Through imaging the vibratory pattern of the vocal folds is captured. They also measure pharyngeal temperature with a probe to see how temperature impacts the use of vocal function. The tasks take a couple of hours to complete. In the Vascular Physiology Lab, Dr. Kluess and Ph.D candidate, Leslie Neidert, collect and analyze the blood and saliva samples for physiological measures. According to Dr. Kluess, few studies use female subjects because of the estrogen hormone fluctuations. However, Dr. Kluess consistently focuses her research on women’s physiology. There is potential for a phase II study after the completion of this study to continue investigating the subject.